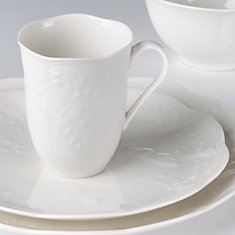 The Butterfly Meadow� Cloud 4-piece Place Setting has garden scenes of raised butterflies and vines embossed on scalloped, pure white, glazed porcelain dinnerware. Set includes a dinner plate, accent plate, bowl, and mug. Ideal for both casual and formal table settings. Diameter: dinner plate: 10 3/4", accent plate: 9", rice bowl: 5 1/2"
Capacity: bowl: 16 oz., mug: 12 oz.